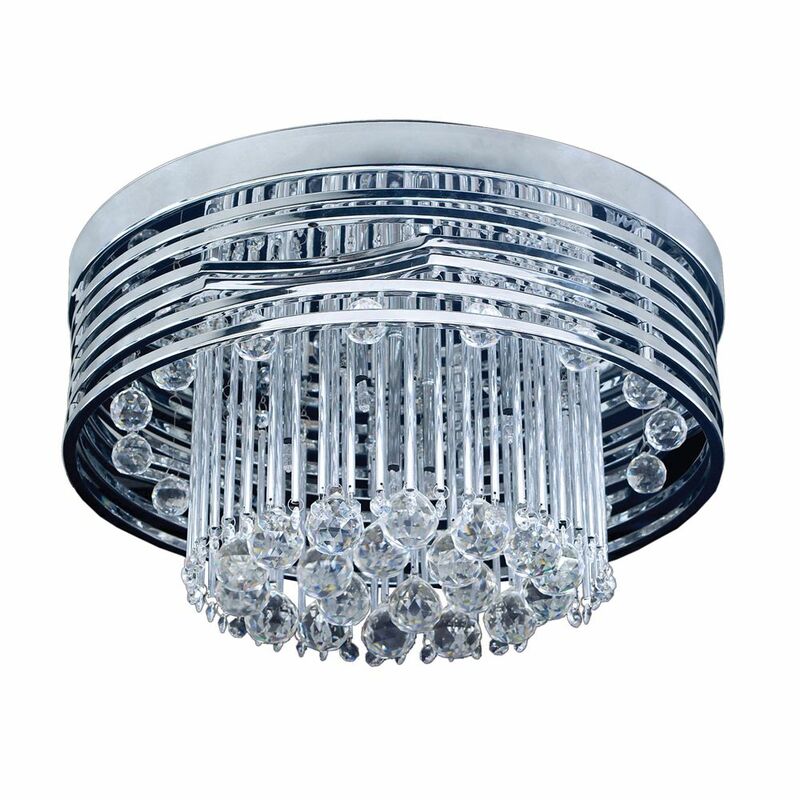 This Flush Mount Goes Beyond Function With Solid Rings Of High Quality Polished Chrome. Clustered In The Center, An Abundance Of Faceted Crystal Balls Hang From Slender Glass Rods. An Additional Ring Of Crystal Balls Encircle The Inside Of The Frame. Experience The Re-Birth Of Crystal! Adorned With 32% Polished Lead Crystal, This Collection Vigorously Captures Your Spirit With An Array Of Graceful And Unexpected Movements, Exuding An Aura Of Energy That Radiates From A Single Point. The Intricately Carved Details And Our Sunset Silver And Dark Bronze Finishes Contribute To The Mystical Beauty Of This Collection. With A Casual Elegance And A Touch Of Classic Styling, This Collection Will Enhance And Bring Warmth To Any Room Setting. Relaxed Proportions, Antique Amber Glass, And Our New Mocha Finish Will Make For An Attractive, Yet Understated Ambiance. A Unique Design To Fit Any Decor. This Collection Exhibits The Same Beautiful Detailing As A Chandelier, But In A Smaller Size Suitable For Lower Ceilings And Smaller Spaces. Each Item Has An Attractive Banding On Top With White Satin Glass And A Decorative Finial. Various Styles And Finishes To Match Your Dicor. 13-Light Ceiling Mount Polished Chrome Flush Mount This Flush Mount Goes Beyond Function With Solid Rings Of High Quality Polished Chrome. Clustered In The Center, An Abundance Of Faceted Crystal Balls Hang From Slender Glass Rods. An Additional Ring Of Crystal Balls Encircle The Inside Of The Frame.